Alternative key art to commemorate the 15th anniversary of the theatrical release of American Psycho and Steelbook re-release. Throughout American Psycho, Patrick Bateman tries his best to keep up appearances amongst his young, affluent, corporate social group, including obsessing over his appearance, acquiring items that signify wealth, and droning on about popular music from Huey Lewis and the News and Phil Collins in a matter-of-fact way that barely hides his disinterest in such topics other than to appear to fit in. Bateman’s self-described “mask of sanity” is built around, amongst other things, conversational touch points that he believes others are interested in simply because they’re popular, so he maintains an encyclopaedic knowledge of them without any emotional depth or substance. What the mask of sanity hides, of course, is a violent psychopath without empathy and a disdain for humanity in general. Similar to Bateman’s choice in music, the art in his apartment was also popular and commercial in the ‘80s including photographs from Robert Longo’s Men In the Cities series (1979) prominently featured in his living room, Emile Bayard’s portrait of Cosette (1886) used on the perennially popular Les Misérables musical poster hanging in his bathroom, and in his bedroom hangs Richard Prince’s Cowboy (1989), which is a crop of Sam Abell’s 1977 Marlboro ad. Our pair of alternative American Psycho movie posters inject Bateman into other popular commercial art of the 1980s which includes a riff on Steve Steigman’s iconic “Blown Away” Maxell advertisement which crossed into pop culture and the commercially popular blemish-free artwork style of Patrick Nagel. 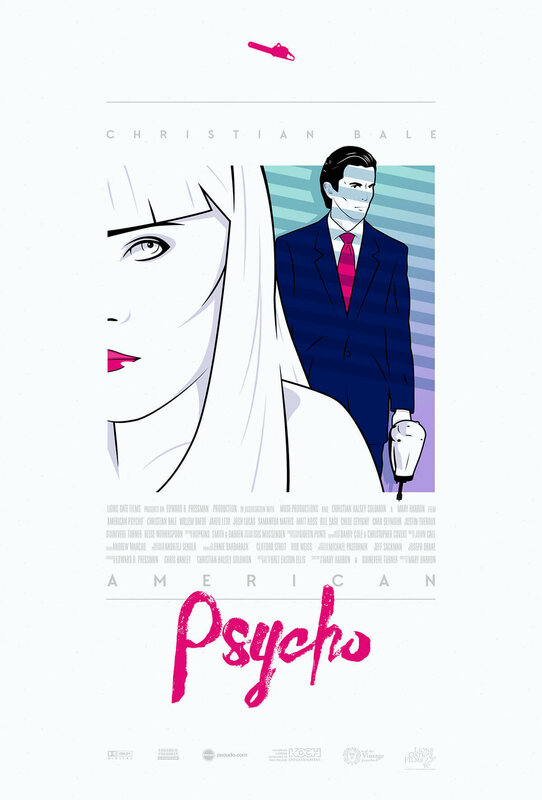 The posters are presented in design styles that could potentially be hung on the walls of Patrick Bateman himself, posters that would add to his “mask of sanity” by tapping into what’s popular at the moment. But true to the film, that mask of sanity has begun to slip, so the posters also feature elements of Bateman’s darker, true self, as well.